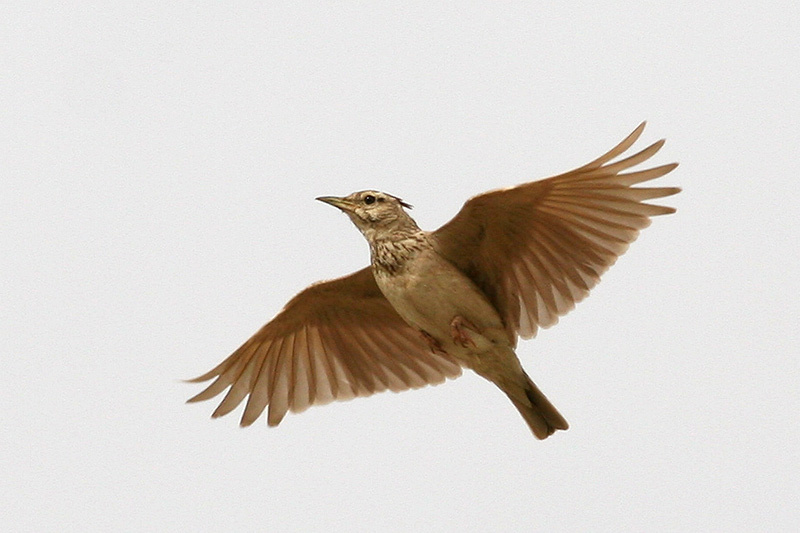 The Crested Lark can easily be recognized by the prominent crest on the head. If aroused, the bird raises the crest. These small birds have a rather untidy and not very colourful appearance, but they have a beautiful song. No matter how tired, the Crested Lark will always be able to sing, emitting a variety of complex, yet beautiful sounds. These birds reach a size of only 17 cm, with a wingspan of no more than 38 cm and they have a grayish brown plumage, with the chest covered in small stripes, while the stomach is grayish yellow. Both females and males have the prominent crest, which is used for signalizing – either to acquire sympathies or, on the contrary, to scare other birds. Crested Larks live in open territories, steppes and meadows in southern and central Europe, as well as North Africa and the Middle East. They prefer territories with scarce vegetation and few trees. Populations living more to the north migrate to warmer areas when the winter comes, while those Larks living in half-deserts, such as in Saudi Arabia, stay at the same place all year round. 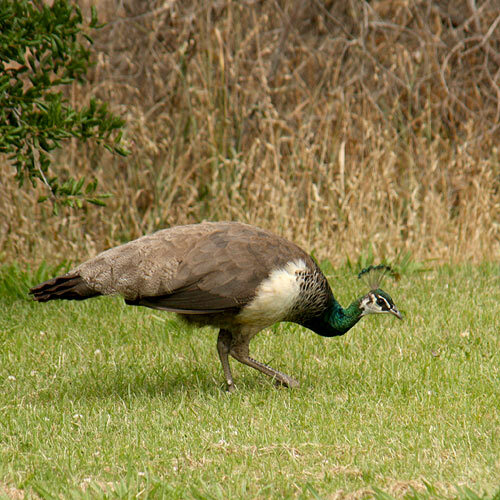 These birds usually live either in pairs or small flocks of 3-5 individuals. 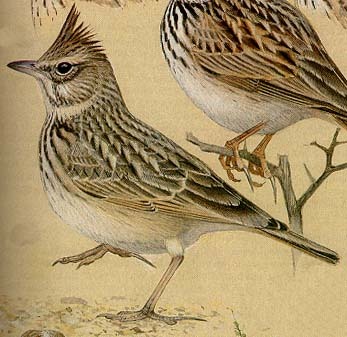 If food is scarce, up to 15 Crested Larks can look for food together. Crested Lark runs along the ground with tiny steps, spending most of the day picking off bugs and seeds from the ground. In the evening, the bird finds a shallow hole in the ground to spend the night in. When sleeping, the bird ruffles its feathers to conserve heat. Crested Lark looks for food on the ground, searching the top layer of the soil and catching bugs, crickets, larvae, spiders and ants with the strong beak. The diet is also composed of a variety of seeds, sprouts and fresh leaves. 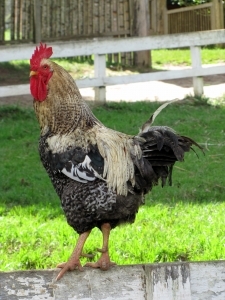 The beak is well suited for breaking the strong chitin shell that bugs are shielded by. In winter, the Lark feeds on grass seeds, because there is often no other food available. In spring, Crested Lark males start looking for a partner – running around, singing, flapping the wings and stretching the neck are all parts of the mating ritual. After a partner has been found, the female builds a nest on the ground and lays 2-4 eggs, which are then incubated for 12-14 days. The male keeps the territory safe of predators and rivals. If another Crested Lark enters the territory, the male tries to daze them with a loud song. Chicks leave the nest 9 days after hatching, but the parents keep feeding them for 20 more days – until they have learned to fly. With the nest on ground, the chicks are quite vulnerable to predators and natural selection begins upon hatching. Although not endangered, this species seems to be decreasing in numbers, as intensive farming and usage of pesticides destroy more and more of the Crested Larks’ nests.